For those coffee lovers out there who experience regular late night cravings, ExoMod is able to cater to your needs. Located on busy Beaufort St Mt Lawley, ExoMod sits neatly on the edge of the street, surrounded by book shops and even a 24hour chemist. 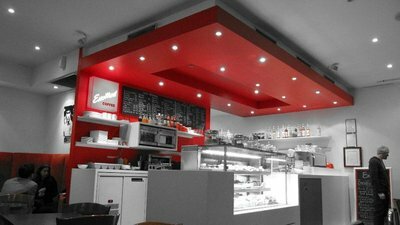 With its menu consisting of delicious cakes, shakes and coffees, it is the ideal place to go if you're a shift worker or simply just a creature of the night. Comfy seats and a cosy atmosphere make it a mellow place you can simply relax at or catch up with friends. Open until as late as 11pm on weeknights and 24 hours over the weekend means that ExoMod will be there to provide yummy cakes for your mellow night in or offer you those much needed coffees after a crazy night out. ExoMod can also appeal to the early birds who need a pick me up on the way to work as its doors open at 7am weekdays.